This is a handy little book, and the least expensive of all the popular general field guides. 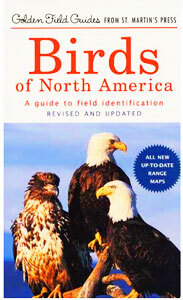 It covers all the birds of North America in one volume, which is small enough to fit into a pocket. Range maps are adjacent to the text and opposite the pictures of the birds. Throughout the book, silhouettes help the reader to recognize birds by their shapes. The text is well organized. The book makes sense of the classification system of birds, a subject which mystifies many birders, by clearly indicating the families and orders. For many species, in addition to the main illustration there are small thumbnail sketches demonstrating typical behavior that may aid in identification. For example, the American Robin is shown running on a lawn and pulling up a worm. Just like they do. These little vignettes often offer excellent clues to the identity of a bird. Unique among North American field guides, the Golden includes a sonagram for most species' vocalizations. A few minutes study of the introduction will enable the reader to use these diagrams to help identify birds and learn their songs. The compactness, low price, and good organization of this book make it a good choice. Even if you have other field guides, with more detailed treatments of each birds, sometimes you just want to carry something small. Something you can tuck in your pocket and not be weighed down. Copyright 2013 Michael and Diane Porter.